After two years of back-and-forth with the local community board, a proposal to link the bike networks of Williamsburg and Ridgewood via the Metropolitan Avenue Bridge may finally be coming to fruition. DOT presented an updated version of the plan, which it first unveiled in June 2014, to Brooklyn Community Board 1 last night [PDF]. 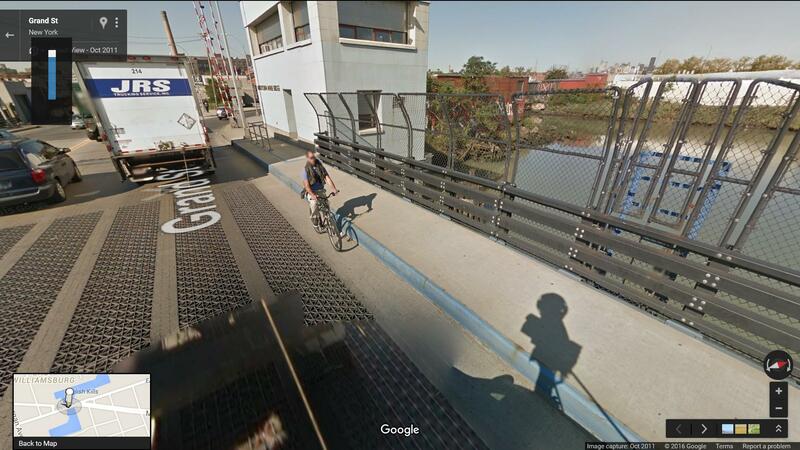 The Metropolitan Avenue Bridge is a critical connection between Brooklyn and Queens over Newtown Creek. Currently there are only bike lanes to the west of the bridge, on Grand Street in East Williamsburg, not on the bridge itself, where cyclists have to contend with heavy truck traffic. With two lanes in each direction, drivers on the bridge tend to go too fast. Two cyclists and one pedestrian were killed on or near the Metropolitan Avenue Bridge between 2009 and 2013, according to DOT. 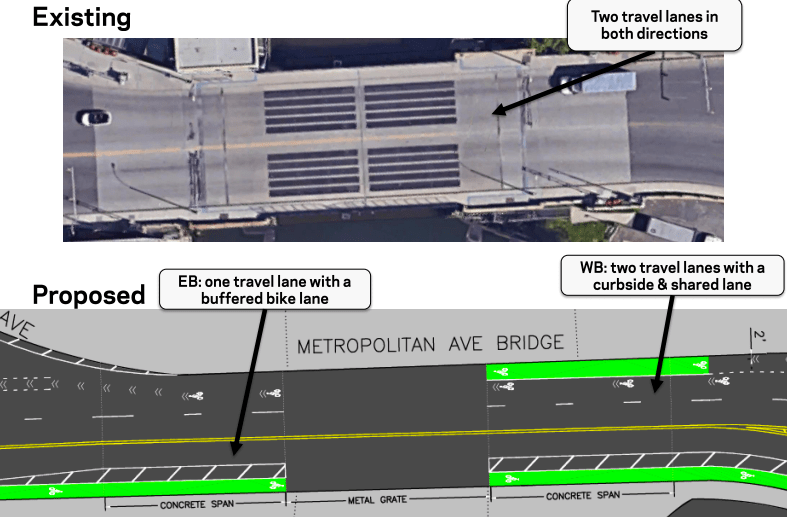 DOT plans to remove one westbound car lane to make room for bike lanes on both sides of the bridge. On the eastbound side of the bridge, the bike lane will have a painted buffer. On the westbound side, in an odd touch, there will be both sharrows and a curbside bike lane. The bike lanes would extend a few blocks east of the bridge along Metropolitan to the Queens border at Onderdonk Avenue. The design presented to the board last year had the bike lanes giving way to sharrows between Varick Avenue and Onderdonk Avenue, but DOT Bicycle Program Director Hayes Lord said the agency decided to extend the lane until the road narrows at the intersection with Onderdonk. At a City Council hearing in November, Reynoso accused DOT of delaying the project at the behest of CB 1 members, but last night he told Streetsblog that DOT subsequently told him the delays were due to the agency’s desire to “make the project better” and connect it to future bike infrastructure improvements in Ridgewood. DOT will present the plan again later this summer, followed by a vote by the full board. I thought east of the bridge was going to be a set of buffered lanes? Why a buffer and no flexibollards too? The trucks are going to wear away the striping on the buffer markings in a matter of weeks like they have on the Greenpoint Avenue Bridge. At least that also has flexibollards for protection… or rather, it had. Last week I noticed nearly every single bollard had been destroyed. I mentioned that point to the DOT rep last night at the meeting, mentioning that there should be bollards if not jersey barriers leading into bollards on the metal grate portion of the bridge. 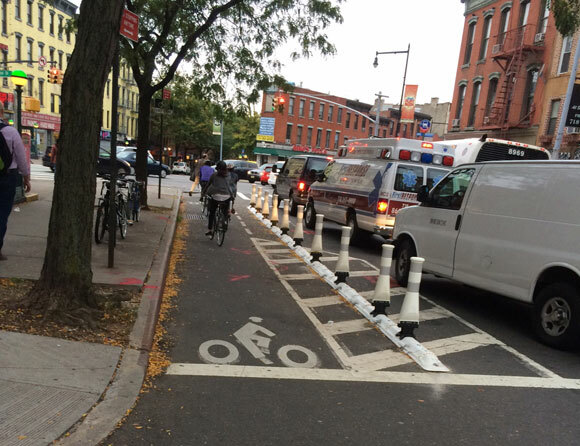 And yes, the Greenpoint Ave Bridge bike lane bollards are nearly all but gone. Sigh. This doesn’t negate the benefit of that sort of qwick kurb, but for what it’s worth the grating isn’t as bad on the metropolitan ave bridge, some of it is filled in with concrete, wide enough strip on the edge for a bike. i’ve been meaning to file a complaint about that but i ride over that bridge only occasionally and the complaint process is a little more involved. I filed a complain about that last year as a bridge guardrail issue. That’s not quite right but it seemed to get routed to the right place. I got a response that it had been fixed, but I don’t get over there much so I can’t be sure. The picture on the bottom is from last weekend. As far as I can tell there isn’t a single flexpost left standing on the bridge. Why is there both a sharrow and curbside bike lane on the bridge westbound? I was glad you asked that. No no no no no no no no no no no this is a horrible design. The bike lane needs to be *between* the two lanes over the bridge westbound. 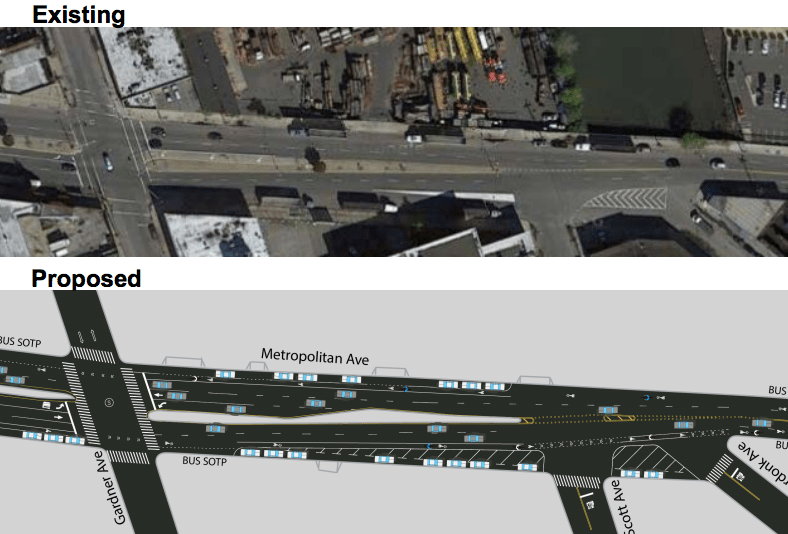 If you’re up against the concrete curb, riders are going to be (a) squeezed from the right as they approach the bridge, thanks to the intersection with Grand St and then (b) right hooked as drivers turn on to Metropolitan from both lanes. The right lane over the bridge needs to be made right-turn only as well. Oh and while we’re at it someone needs to do something about the illegally parked cars and trucks on Metropolitan between Woodward and Onderdonk westbound.